Leading a rebranding isn’t easy (heavy is the head that wears the crown, right?). There is an unending list of questions you can ask yourself, your team, your clients and your prospects when beginning the process. So where do you start? 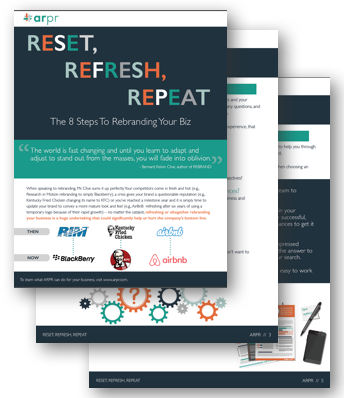 If you are in business long enough, rebranding or refreshing your brand is inevitable. So, the million-dollar question is, how do we make sure we’re one of the rebranding success stories? What questions to ask yourself and your executive team before beginning your rebranding process. How to select the right agency partner to serve as an unbiased third party throughout the process. How to ensure your brand's look, feel, tone and message evoke the desired emotions from your target audience. Why it is necessary to perform a temperature check to determine when the rebranding process should be repeated. "The world is fast changing and until you learn to adapt and adjust to stand out from the masses, you will fade into oblivion." Named a 2017 top Tech PR Agency by O'Dwyers PR and a PR News Top place to work, ARPR is a results-driven public relations and integrated communications agency helping global leaders and growth-stage technology brands #MakeNews and #DriveLeads.